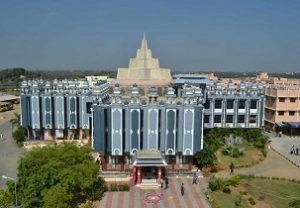 Sri Chandrasekharendra Saraswathi Viswa Mahavidyalaya, formed under the aegis of Sri Kanchi Kamakoti Peetam Charitable Trust in 1993, is located in a sprawling complex of 50 acres at Enathur, at a distance of about 4 Kilometres from Kanchipuram.The University has a campus in Poonamalle, Chennai, housing an ayurveda College, research centre and hospital.The University has a unique focus on integrating traditional knowledge with modern scientific practices with a global outlook. The Maha Swamiji of Sri Kanchi Kamakoti Peetam had cherished a desire to revive Kanchipuram to its pristine glory as a center of learning. The Viswa Mahavidyalaya at Kanchi was established with the benign Blessings of Their Holiness Pujyasri Jayendra Saraswathi Swamiji and Pujyasri Sankara Vijayendra Saraswathi Swamiji and it attained the status of Deemed University in 1993.The university is on a campus of 50 acres (200,000 m2) at Enathur, four kilometres from Kancheepuram and 76 kilometres from Chennai. 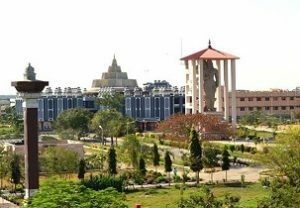 The institute has a huge complex that houses class rooms, air conditioned seminar halls, Central library, Departmental libraries, Internet connectivity, and so on. The web centre has high end servers and is connected by NKN (National Knowledge Network) 1 Gbps Intranet / Internet connectivity via NIC.Internet connection is available campus wide, through the campus network, to enhance research and teaching activities. The Computing and development centre has high end client systems which are used by staff and students for research and development activities.WiFI connectivity is also being setup for the use of students and staff. To give top priority to social dimension so that each hosteller comes out of SCSVMV Hostels should discharge his/her duties as a responsible citizen of the country. SCSVMV University provide career guidance and opportunities,On-Campus Interviews,Off-Campus Drive,to sign MoUs with leading companies. The Training & Placement Division has arranged for the Career Development / Personality Development programmes for the benefit of the students, is to build a bridge between the University and the industry and to forge a symbiotic relationship . (ii) Attending the counselling for the said course at the notified date, time and place. Admission to all courses is based on the merit, category of the candidates, and the availability of seats at the time of counselling. At any time, if the SCSVMV University authorities find that admission has been offered based on false/ incorrect information/ documents and suppression of relevant facts, education qualification, the admission offered or the admission already completed shall be cancelled, irrespective of the stage of study of that course.